Upanishads contain the basic teachings of Hinduism and it needs no introduction to Hindus. Upanishads are today available today in all regional languages in India and also in most of the important languages around the world. Those wishing to read Upanishads in Malayalam, the language spoken mainly in Kerala in India, can now download it in pdf format or read online at the archive project. 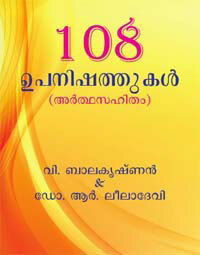 The book is the Malayalam translation of the famous book titled 108 Upanishads. The translation is done by V Balakrishnan and Dr Leela Devi. You can read it online or download it in pdf format at the archive site. Note – you will need pdf reader installed to download or read it online.